Soon, we’ll be eating our fair share of sweet potatoes, butternut squash, and kale. As we enjoy these fall favorites, we’ll also be reminiscing about the tomatoes, peaches, peppers, and other summer abundance. It always amazes me how the first taste of a season can be wonderful, but by the end of the season, we often tire of those same wonderful flavors. It happens to the best of us. Creativity is the key to eating seasonally! During my weekly visit to LL Urban Farms, I loaded up on tomatoes and peaches. 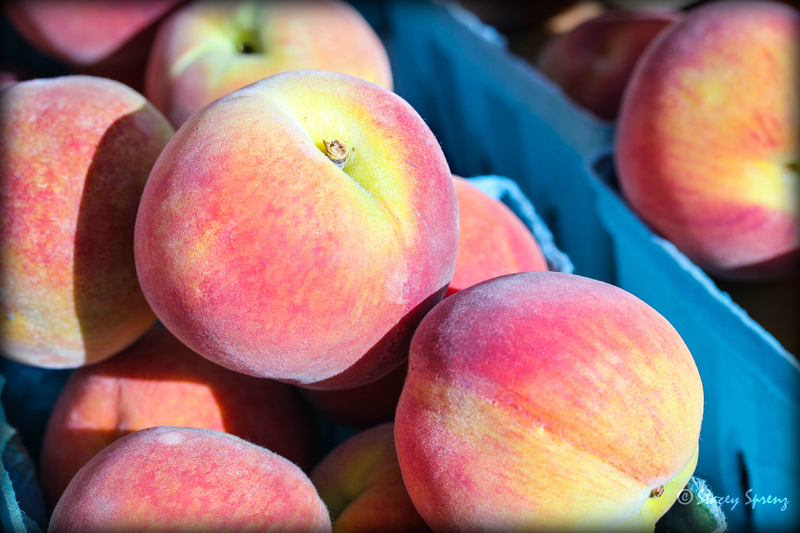 I knew the peaches would be disappearing from the market soon. We still have some time for the tomatoes, but with temperatures falling into the 50’s at night next week—they won’t be around long. So, how do I savor these delicacies one more time before they are gone? When we lived in southern California, one of our favorite spots was San Diego. In San Diego’s Little Italy neighborhood, there is a restaurant called La Villa. If you visit San Diego, you must go there. 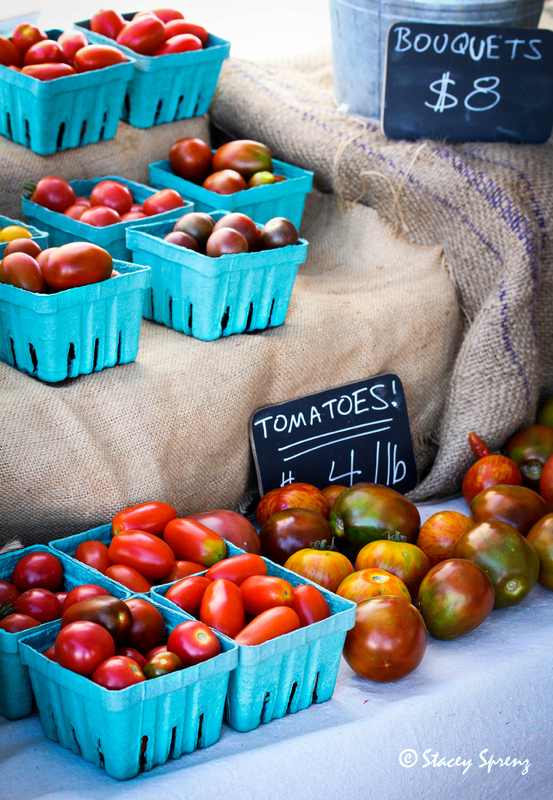 Farm-to-fork is their mission, and they do it well. Their simple Italian recipes will make you weak in the knees. One of my favorite salads there was an heirloom tomato and stone fruit salad with burrata and micro greens. 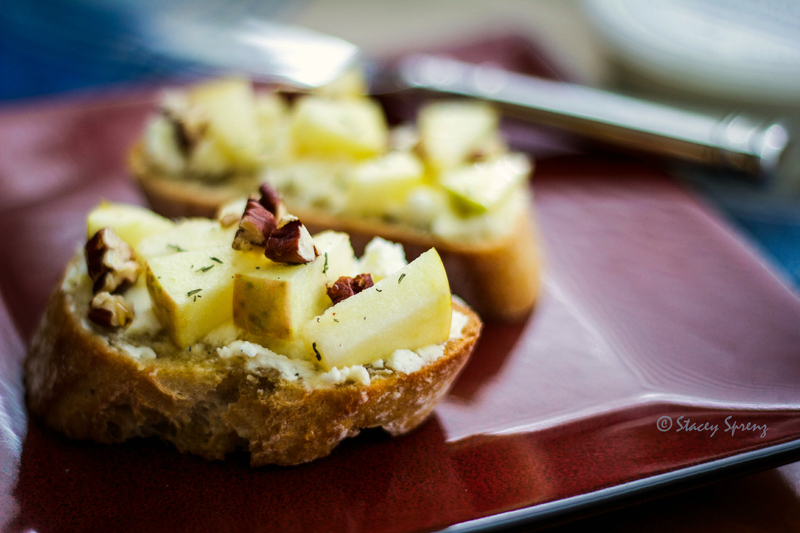 Many of my dishes are an attempt at recreating an amazing dining out experience. I had been thinking about this salad for years! Using this for inspiration, I threw together some peaches, cherry tomatoes, burrata, and basil from my garden. 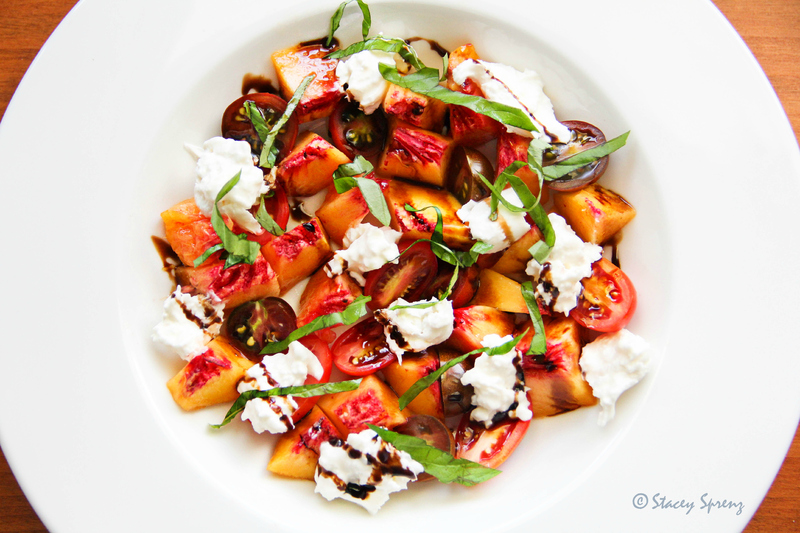 A little drizzle of balsamic, and the dish was complete. Not exactly the same, yet satisfying. It’s the perfect use of the “last gasp of summer”—which is a phrase my friend, Chana (a.k.a @raleighwhatsup), used to describe the recent hot weather. I couldn’t have said it better. I suppose this last gasp of summer weather and summer bounty will give way to chilly nights and crisp autumn air soon enough. Fall is my favorite season, so I am eagerly awaiting this change. Until then, I plan to get my fill of corn, tomatoes, peppers, and peaches because it’s going to be a long time until we see them at the farmers markets again. I love the way my house smells when granola is baking in the oven. Cinnamon, vanilla, toasting oats—it smells nostalgic. It reminds me of the holidays when the scent of cinnamon regularly wafts through the air. I must admit it’s nice to have the smell of the holidays any time of the year. If you’re a fan of granola, but you are still buying the boxed stuff, I encourage you to make it…at least once. I was a frequent buyer of the boxed stuff. Honestly, it doesn’t have much flavor, and it is often high in fat and sugar. Then, I discovered the specialty granolas, which are divine but can be quite pricey if you love granola as much as I do. So, making my own became a necessity. 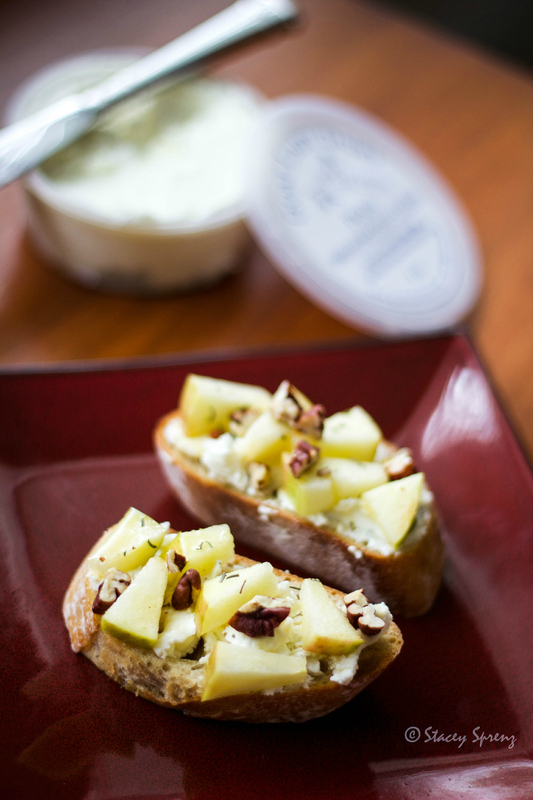 This recipe is a melding of many recipes that I have tried over the years. I often change the types of dried fruit or nuts that I add based on what I have in my pantry or what sounds good. I like the freedom this recipe provides. I have even played with the spices, adding a pinch of nutmeg or clove for depth. One thing I do not mess with is the oil. Coconut oil is perfect for granola because it adds a hint of flavor, but it is not too heavy like a canola or vegetable oil. I believe coconut oil is better for you, too. 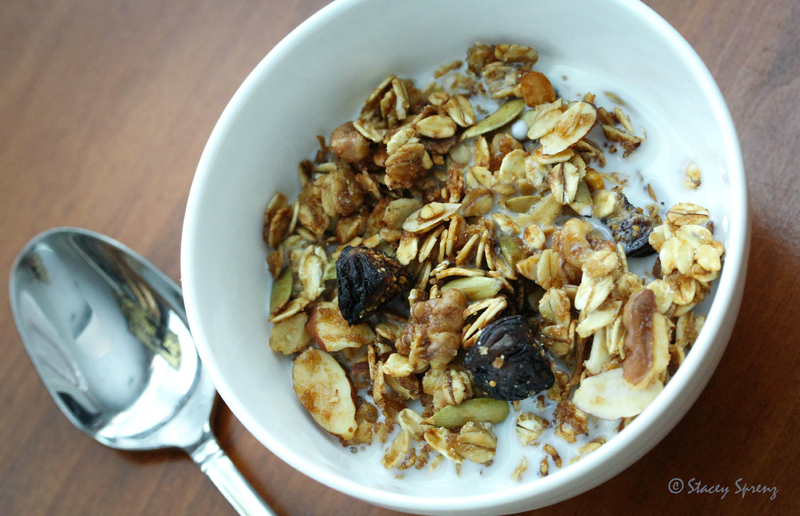 What is my favorite way to eat granola? I prefer a splash of almond milk and a spoon. You can also sprinkle it on fruit and yogurt or eat it dry as a snack. I give it as gifts—fill a mason jar with granola and add a tag that says “Free Refills”—and you’ll have a friend for life! In a large bowl, combine oats, nuts, seeds, cinnamon, and salt. Place the honey and coconut oil in a small saucepan over medium heat. Using a whisk, stir to incorporate the ingredients as they melt. Do not allow the mixture to simmer or boil. Once the honey and oil are warmed through, remove from heat and whisk in the vanilla. Pour the honey mixture over the oat mixture and stir to coat completely. Divide coated oats between two sheet pans and spread evenly on each pan. Bake granola for 40 minutes—stirring every 10 minutes. Allow granola to cool in the pan. Transfer to a large mixing bowl and add the dried cherries. Combine thoroughly and store in an airtight container. Keeps for about a month—if you can make it last that long! 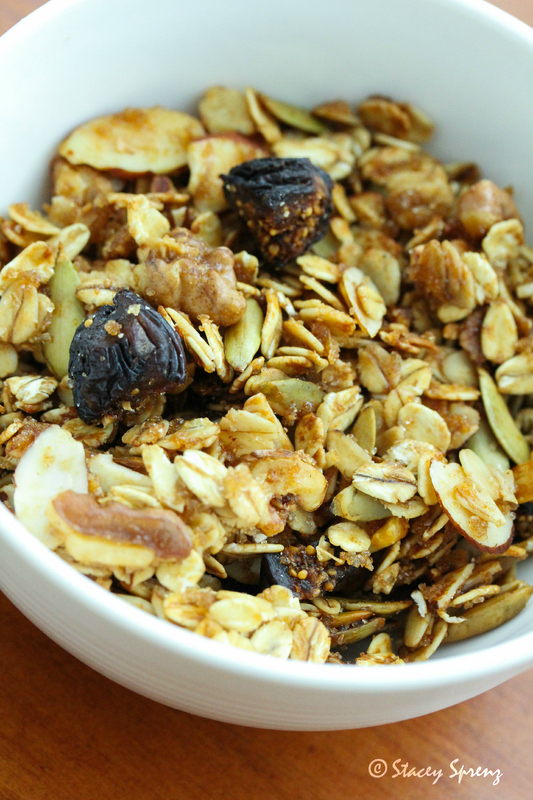 This batch of granola included chopped Mission figs and pecans. Almond milk and a spoon…it doesn’t get any simpler than that.